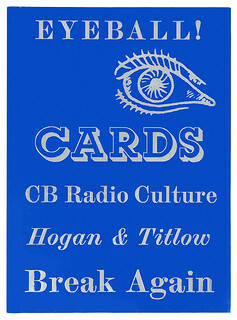 Eyeball Cards: The Art of British CB Radio Culture (William Hogan, Four Corners Irregulars, £14) is the first in a series that will be ‘introductions to important but overlooked areas of creativity’. The book documents the subculture of the UK Citizens Band radio in the 1970s and early 80s – a two-way radio system with its origin in the US – whose popularity soared among the trucking community during the fuel shortages of the early 1970s. Truckers would share data on where fuel was delivered and swarm the pumps. The UK subculture also imported the practice of creating its own business cards, which they would swap when finally meeting, or ‘eyeballing’ each other. 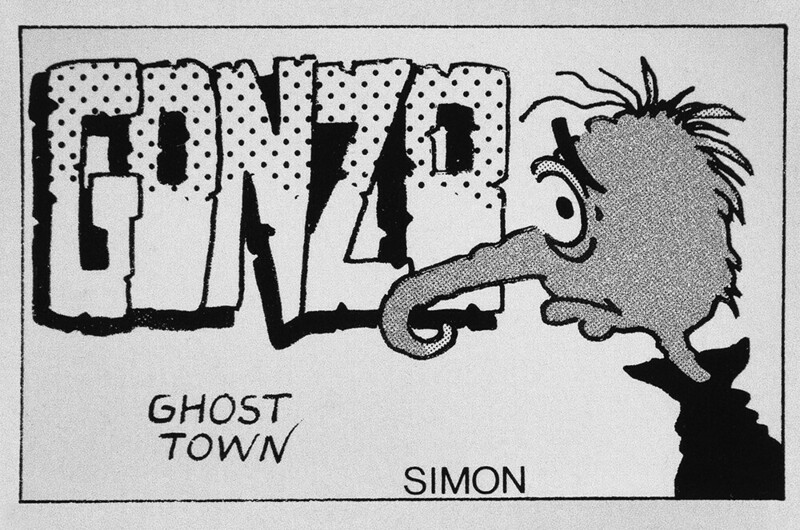 These roughly printed cards pulled in animals and objects as artefacts of self-identity that float across the airwaves – Dirt Demon, Mutley and Miss Piggy, Bean, Bounty Bar, Black Tulip, Kodak Lady and Fruitcake. The imagery ranged from cartoonish self-mythology via seaside postcard humour to simple icons and typography. The book’s layout, by John Morgan Studio (see Eye 83) is broken up by photographs of the ‘breakers’ – the CB radio users and card-makers – by David Titlow, who won the Taylor Wessing Portrait Prize in 2014. The cards are occasionally scaled up to double-page spreads, sometimes laid out vertically. There is a lot to take in: the line between Citizens Band and citizens’ Babel is constantly negotiated. It is a testament to the love and creative skill of all involved that this vast amount of visual and cultural noise makes a joyful kind of sense. 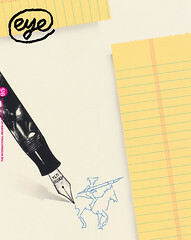 Though the mix-and-match fonts on the cover suggest the anarchic visual culture of truckers’ eyeball cards, the silver embossed type on the blue-gloss hardback is where Morgan’s design begins to make sense of these random items, turning a loose arrangement of folk culture into the formal shapes of history. Right and top: Cover and spread for Eyeball Cards: The Art of British CB Radio Culture by William Hogan.